Ex-penitentiary official’s accessory to embezzlement denied parole | Russian Legal Information Agency (RAPSI). 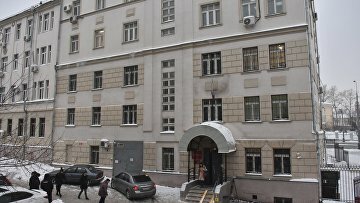 MOSCOW, March 25 (RAPSI) - The Lefortovsky District Court of Moscow on Monday refused to release an accomplice of ex-deputy chief of Russia’s Federal Penitentiary Service (FSIN) Oleg Korshunov, entrepreneur Marina Dyukova convicted of embezzlement, on parole, RAPSI reported from the courtroom. The woman applied for parole on the grounds of her guilty plea, partial compensation for damage caused and a good conduct certificate from a penal colony administration. Prosecutors and victims objected in court to her release on parole. Last December, the Moscow City Court upheld a 2.5-year prison sentence given to Dyukova. The Meshchansky District Court of Moscow convicted Dyukova, an accessory of Korshunov to large-scale embezzlement, in November 2018. The case was heard under a special procedure without examination of evidence and witness interrogation because the defendant pleaded guilty and cooperated with investigators. According to investigation, Dyukova conspired with Korshunov and another FSIN official Svetlana Alekseyeva to steal budget money allocated for centralized purchase of fuel and sugar for penitentiary facilities in 2016. Officials, in turn, promised to sign overpriced contracts with her. Investigators claimed that Alekseyeva included certainly impracticable demands of supplies of more than 7,000 tons of sugar to penitentiary facilities across Russia within 20 days in tender product purchase documentation. Dyukova in turn submitted to the FSIN commercial proposals on sugar delivery at overvalued prices by companies affiliated to her and not engaged in sugar supplies.